23 | March | 2012 | Based on truth (and lies). Following the final attack of the birds, the Brenners escape the house – a key scene with the principals that remained to be shot. Hitchcock was still pondering the film’s ending. Should the birds keep up their attack? Why were the birds attacking? Why? The moron millions would want some answer, and he hated tidy answers. It was during the last days of principal photography that Hitchcock decided to scrap [screenwriter] Evan Hunter’s ending [ed. note: Hunter discusses his original ending here], and excise several pages of dialogue and storyboarded visuals in favor of a single lengthy shot that would show Melanie (Tippi Hedren) and the Brenners slowly driving away in their sports car, crossing a bird-infested landscape as dawn breaks overhead. No final pursuit by the birds; no implication the attacks have spread – or have ended. The future was left ambiguous. To Hunter, Hitchcock’s ending was a betrayal, yet its message was faithful to Daphne du Maurier’s novella. More important, it was true to Hitchcock – the kind of open ending the director had always preferred, salvaging his characters without offering any false reassurance that evil had been entirely vanquished. The ending was also a technical accomplishment, weaving the actors together seamlessly with a horde of live, dummy, and optical-illusion birds, against a background which is one of Albert Whitlock’s finest matte paintings. 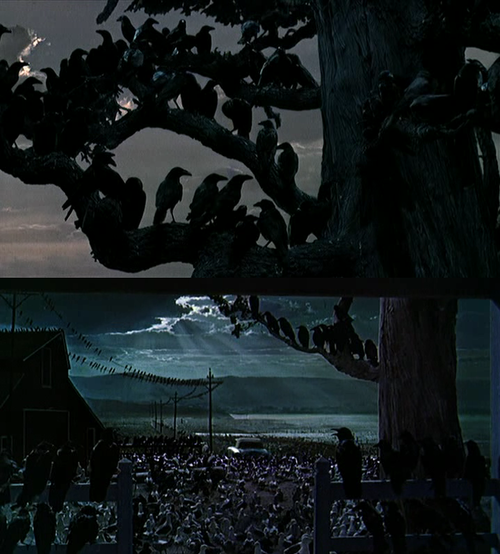 Thirty-two different exposures were required for the film’s final image, which remains stunning – “the most difficult single shot I’ve ever done,” said Hitchcock.